Trish Neil | Living and working on the Central Coast, NSW. 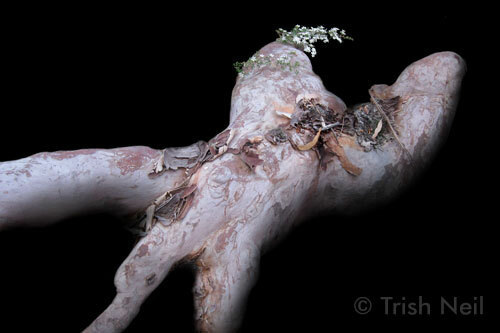 Over the last 2 years I have been working on Dryads in Black, a sub-series within my wider Anthropomorphs series. 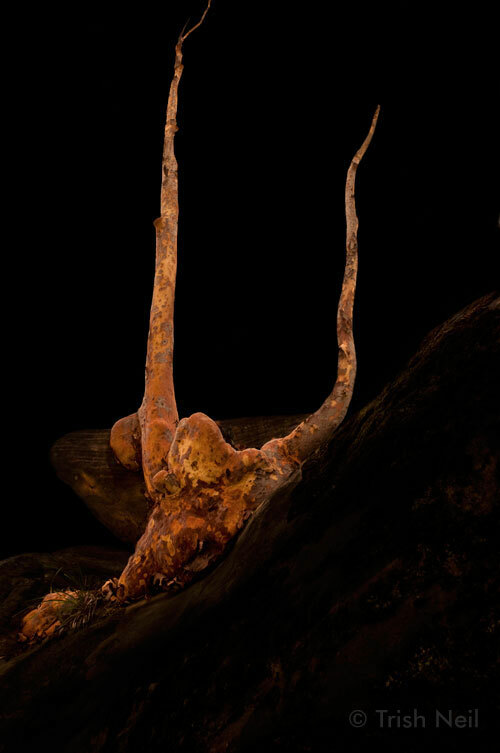 The works in the Dryads in Black series are about perception and memory; how particular elements in the bush – in this instance the baroque, anthropomorphic forms of the Angophora Costada or Sydney Apple Gum – resonate with meaning. Isolating each form, revealing it by contrast with the void of pure black, evokes the mystery which the bush seems to communicate. 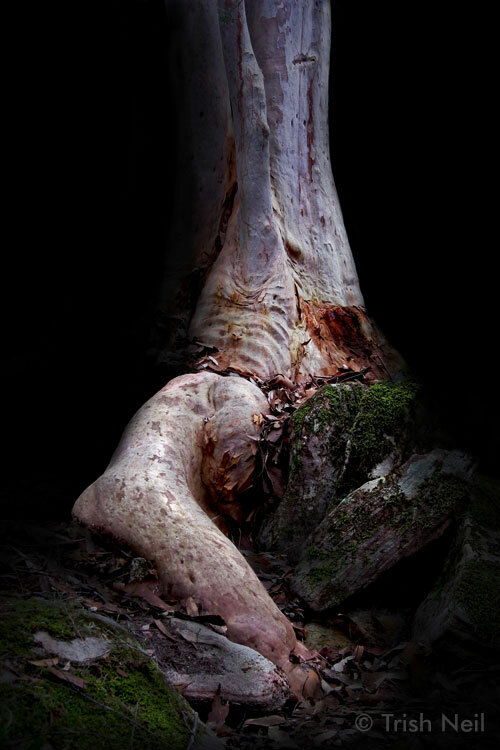 The story of the dryads, who dance in the darkness of night only to be captured in tree form at the first touch of light – asleep, or stretching, or still active – this myth encapsulates that sense of immanent meaning which never quite becomes explicit. Working in photo media gives the particular quality of image reality; working in Photoshop gives a direct interface between reality and imagination, a way to actualize metaphor. 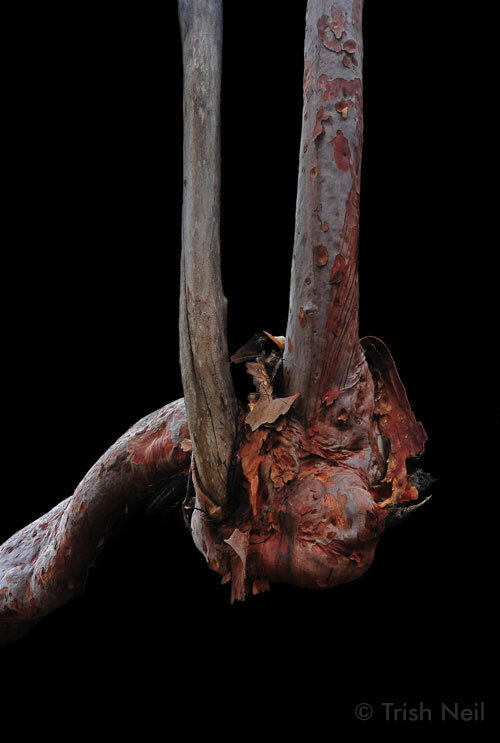 The form of each tree is unchanged; these trees are as found in the bush. By subtracting the surrounding tangle of undergrowth I can show each tree as I perceive it, or as it reveals itself in my mind. Each one has its own persona: the bride; the journeyer emerging from darkness to freedom; the sleeper, the expression of anguish …… the body language of trees. Thank you, those are beautiful words, to move someone like that is the reason to show your work. Hi Trish, this series is really beautiful. The one at the bottom looks like an antlered head to me. Amazing. Thank you – and my apologies for being so tardy in responding! I have been thinking about animism a great deal lately, because I have been discovering a little about the aboriginal people, their beliefs, and in particular, the rock engravings that abound in this area – an hour or so’s drive north of Sydney. This impulse, to find spirit or meaning in nature, seems pretty deeply embedded in human beings. Shamanism is presumably the earliest form of religion. I think this is why we respond to, for instance, these tree forms that look like people or animals, with such pleasure.